Brown rice, carrots & green beans, mixed through a honey soy sauce & topped with pork fillet. Pork fillet: Place a pan on medium-high heat with a drizzle of olive oil. When hot, brown the fillet for 4-5 minutes. Then place in the oven on a tin foil lined baking tray and cook for another 8-10 minutes. Remove, slice and season with salt and pepper. Honey soy sauce: Mix together the coriander, soy sauce, rice wine vinegar, garlic, honey and oyster sauce. Veggie stir-fry: Place the same pan you used for the pork on high heat and add a drizzle of olive oil. Add the carrots and green beans and stir-fry for 4-5 minutes until cooked, but with a slight bite. Mix through the rice with HALF the honey soy sauce. 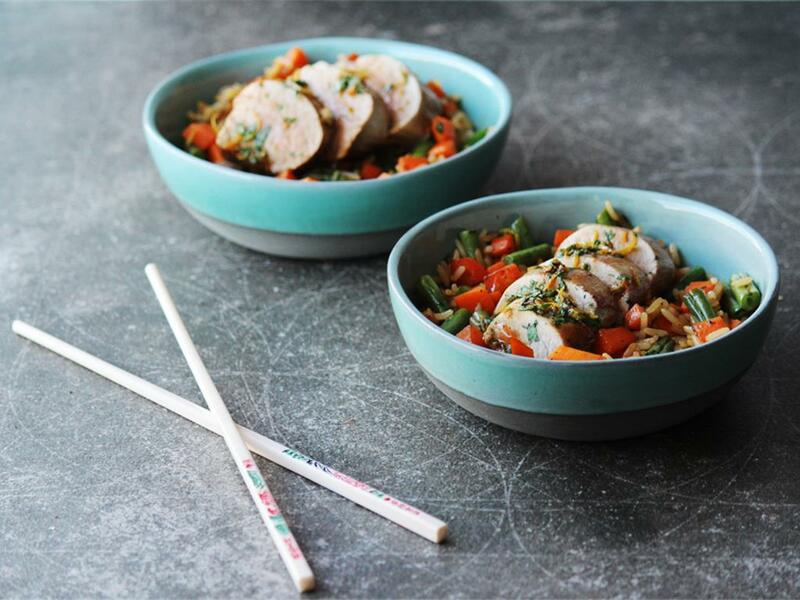 Serve the sliced pork fillet on top of the vegetable rice and drizzle over the REST of the sauce.